My latest post is up at PopMatters. 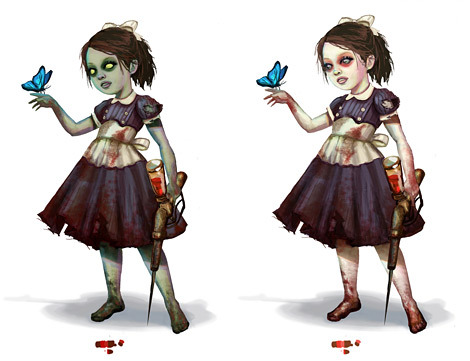 It’s about one of last year’s best games: BioShock 2. Like most people, I loved the first BioShock and I wasn’t alone in fearing what a sequel might look like. I, along with many others, had placed BioShock on some sort of mental pedestal; while it wasn’t perfect, it was a formative experience in terms of how I viewed the medium. Unconsciously, I had turned it into a sacred object that should remain untouched. To be fair, sequels don’t always turn out well, and an overabundance of them can kill even the mightiest of franchises; just ask Tony Hawk. Thankfully, BioShock 2 is an excellent game that managed to perform a splendid kind of blasphemy: in many ways it is better than the original. Writing this has left me with few lingering thoughts: First, BioShock 2 has drastically increased my already high hopes (pardon the pun) for BioShock Infinite. Despite my reservations over “franchising” the series, the prospect that some of the best minds behind BioShock and BioShock 2 are working on the same game makes me giddy. Second, has there ever been a sequel to a game of BioShock proportions that has harmed the first game? Or, to jump into another medium, does the Phantom Menace cheapen A New Hope? The entire BioShock 2 experience has taught me to assume a more relaxed frame of mind regarding the artistic impact of sequels in general. There is no point in trying to “protect” certain games from the effects of potentially sub-par sequels. At worst, the sequels can be disregarded and one can choose to mentally envision the original as an unconnected entity. At best, a supposedly unwanted addition can expand on the original’s potential and fuse the discrete works into an entity stronger than either one of the individual pieces. I never tried Bioshock 2 feeling, like you did, that a sequel couldn't live up to the original. But maybe you're right. Maybe I just need to get that game down off it's pedestal. Personally, excepting its slow start, I felt BioShock 2 was much superior to BioShock as an overall package--though it needed BioShock. Instead of focusing so much on the environment (which could speak for itself), more character development was had. I think I mentioned it in my article on Grace Holloway on The Border House, but even with the audiologs in BioShock, it felt you were moving through a space with two big personalities at war who overshadowed everyone else, or consigned them to lackeys. The characters in this game gave me more of a glimpse of what living in Rapture had to be like. "The entire BioShock 2 experience has taught me to assume a more relaxed frame of mind regarding the artistic impact of sequels in general. There is no point in trying to “protect” certain games from the effects of potentially sub-par sequels. At worst, the sequels can be disregarded and one can choose to mentally envision the original as an unconnected entity." I don't think this is quite so easy. While we can choose to discuss a work in a vacuum, it doesn't really work that way. The Phantom Menace is a perfect example, because it doesn't just exist alongside A New Hope: it exists in the same continuity. While Darth Vader was a mysterious, ambiguous figure in the original trilogy, he simply isn't anymore. We know his history in detail. If we want to consider Darth Vader solely in the context of the OT, we have to sort of play pretend. Now, I generally agree with you that we don't need to get worked up over a mediocre sequel. But at the same time, if I had to pick between good/bad/irrelevant, then I'd say a poor sequel to a good game is "bad." At worst, IMO, a bad sequel pollutes the original work by association. This is all unrelated to BioShock 2, though, since I did like it. I wasn't a huge fan and thought it wasn't nearly as memorable as the first game, but there were definitely things I appreciated about it. So often, the gaming industry/community is a cynical place, so it was great to have such an unexpected surprise. And, thanks for that great post on Grace Holloway, Denis. I'll be citing it in another upcoming post! That being said, I do think it's interesting to view sequels as more loosely connected to their predecessors. For example, can we even say that the Darth Vader in the prequels is the same as the Darth Vader in the original trilogy. New Vader talked about midichlorians and padowans; things that don't even exist in Old Vader's universe. Can we even say that the two Vaders were created by the same person? 1970s Lucas had real financial and creative limitations that resulted in different outcomes. 30 years, millions of dollars, and countless "yes-men" later, is he even the same man?